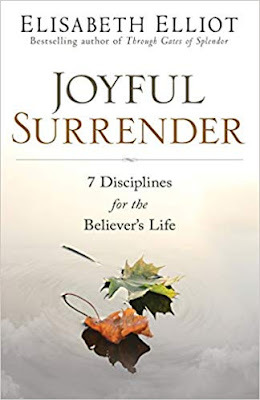 Considering the fact I had reviewed one other Elisabeth Elliot book some time back I find it an honor to review this one -- Joyful Surrender. I always find it interesting how missionaries do their charitable Christian work and admire them that are able to do so. Through it all Elliot is one of those few who showcase a genuine zeal for not simply loving others but loving God as well. How I do desire to be such in my own walk with Christ as well. Yet, what I can say for Elisabeth Elliot's book are a couple of things, the first of which is it has been retitled from a book that was published in 1982, Discipline. The second is that the work overall is to help the Christ follower find an acceptable way to living a life of surrender to the One who gave all so we have abundant life before He takes us Heavenward: Jesus Christ. I enjoyed this book, even if it is a retitled book, due to the nature of how it was written. In fact, I am contemplating re-reading it to see what other gains can be had. Overall, I can say it's a delightful book she wrote, one in which Elliot does a masterful job in doing. In her life, Elisabeth Elliot not only was a missionary but she penned more than twenty books including The Journals of Jim Elliot and Passion and Purity. I received a complimentary copy of this book for a fair and objective review from Revell.